As an experienced China crawler excavator manufacturer, we are fully aware of that crawler excavator operators not only require a high-performance crawler excavator but also a comfortable, safe operating environment. 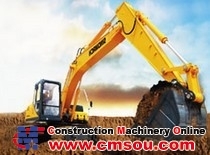 Thus, we design and manufacture our crawler excavators keeping in mind the operator comfort and safety. 1. The cab adopts the latest in aircraft cabin design, uses pillars made of superior rigid materials, and is equipped with necessary safety devices. This enables you to operate in a safe and secure environment. 2. Luxury interior, high power air conditioner, color display instrument and advanced control system, coupled with spacious leg room, short-stroke lever and suspension seat, combine to maximize operator comfort and minimize fatigue. 3. The unique sunroof design enables you to enjoy fresh air outside while not compromising UV resistance. 4. Eight air outlets provide easy access to springlike weather, contributing to higher working efficiency.